Post drafted on Sunday, December 11. I have been staring at Becky Higgins’ Andes Mint Cookies on and off in what might be the last 24 hours. Since seeing it featured in her 12 Videos of Christmas, I pulled up the recipe and it’s been there in the background while I got busy with other online activities. I love chocolate cookies, and mint chocolate is a household favorite – Andes Mints being one of the brands I love. It is probably not a coincidence that I saw Andes Mints the one time I accompanied my Mom for grocery shopping two weeks ago. At the time, I successfully kept myself my buying a package or two. But this recipe is the perfect excuse to go get some. The thing is, I haven’t baked anything in over a year. Since moving companies, in fact. Christmas has always been a time for cooking and baking. Families would be doing so much because they have people over, or they make stuff to give and sell. I was like that for several Christmases in the past ten years. I loved spending hours baking goodies even when I know that at the end of it all, none would be left for me to eat because they’re all orders and I only make enough to cover orders. Being so busy in the kitchen gave me sleepless days and nights because I still had my regular job to attend to. Again, the thing is, I haven’t baked anything in over a year. My stuff is all over the place. I’ve got ingredients that have likely spoiled already. 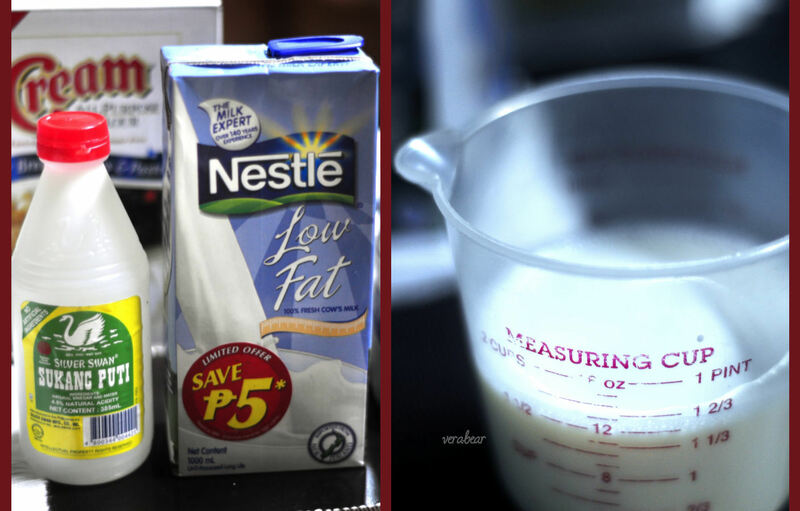 Measuring spoons and cups have been used for other purposes. Our kitchen isn’t ready for my baking. So in order to get baking, I first have to be organized. Organize and declutter my baking supplies, and hopefully our entire kitchen area while I’m at it. That’s what’s keeping me from baking. I’m so lazy to do the work so I can get to what I love to do. Let’s see if I can get over it today. Or this week. Besides, it would be nice to give away some homemade cookies. 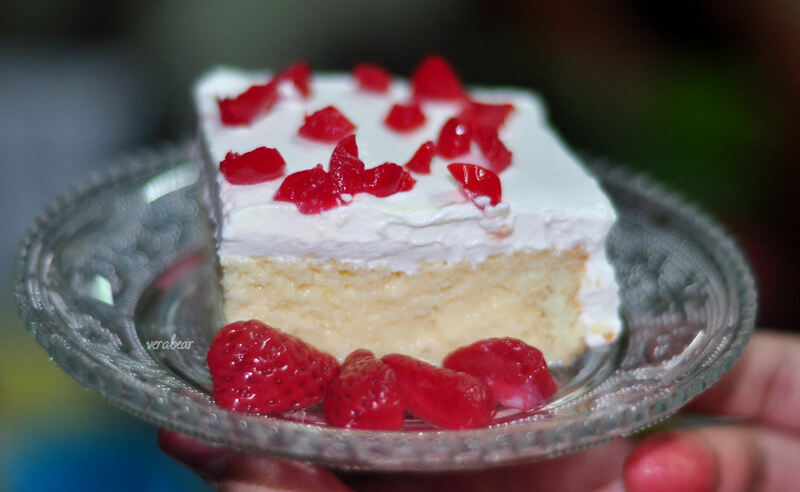 My new favorite cake: Tres Leches! It was so moist and yummy that I decided that we had to make another batch the next day so my parents could have it too. The next photos are from Sunday’s baking session. I used to be afraid of separating egg whites from the yolks, but I didn’t do so bad. Specially on this second go. It was part of the fun! The real feat? Not getting any of the shells in the cake! haha 🙂 Anyway, the whites had to be separated from the yolks because they needed to be dealt with differently. 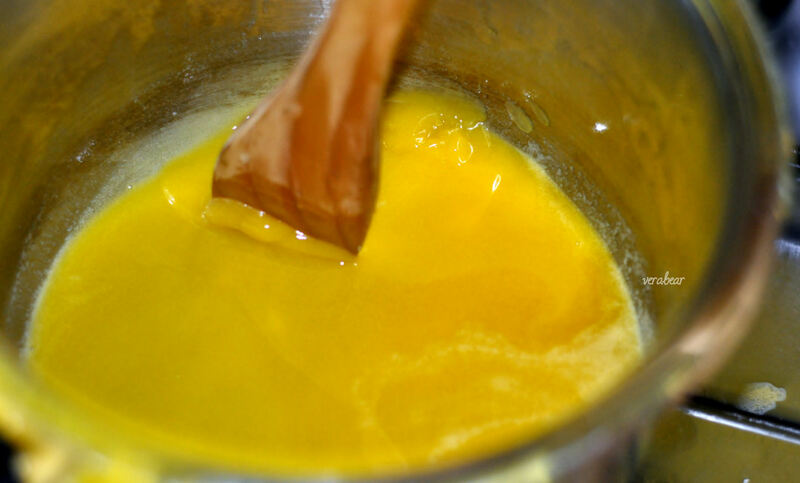 First went the yolks, beaten until it doubled in volume and turned a pale yellow. Vanilla and some sugar was added in too. I mixed it lightly with the flour mixture first. 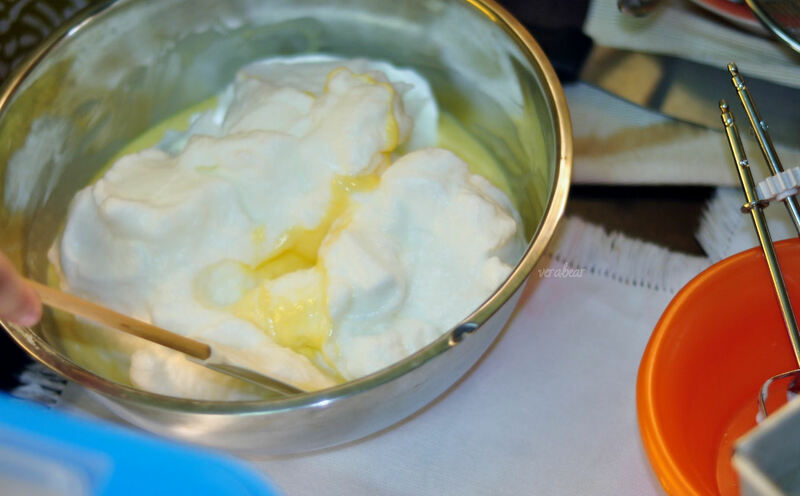 Next went the egg whites, this was another fun part even though the mixer pretty much did the work. Beat at high-speed with some sugar, until soft peaks form. 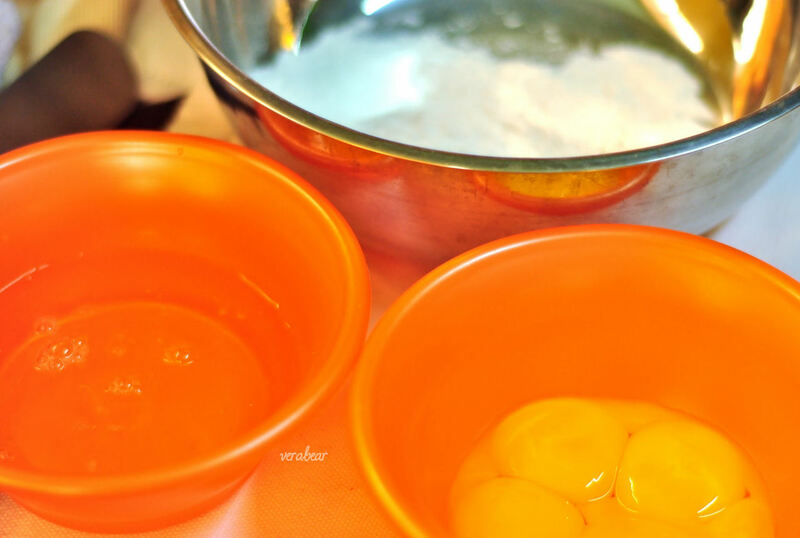 Fold it in with the flour and egg yolk mixture. Even back in high school, folding mixtures was my favorite part of the baking process. As soon as it all combined, I plopped the entire mixture onto one greased pan, and baked it in a 350-degree oven for 35 minutes. Alfred’s my tester, so he’s the one doing the toothpick test on the cakes. 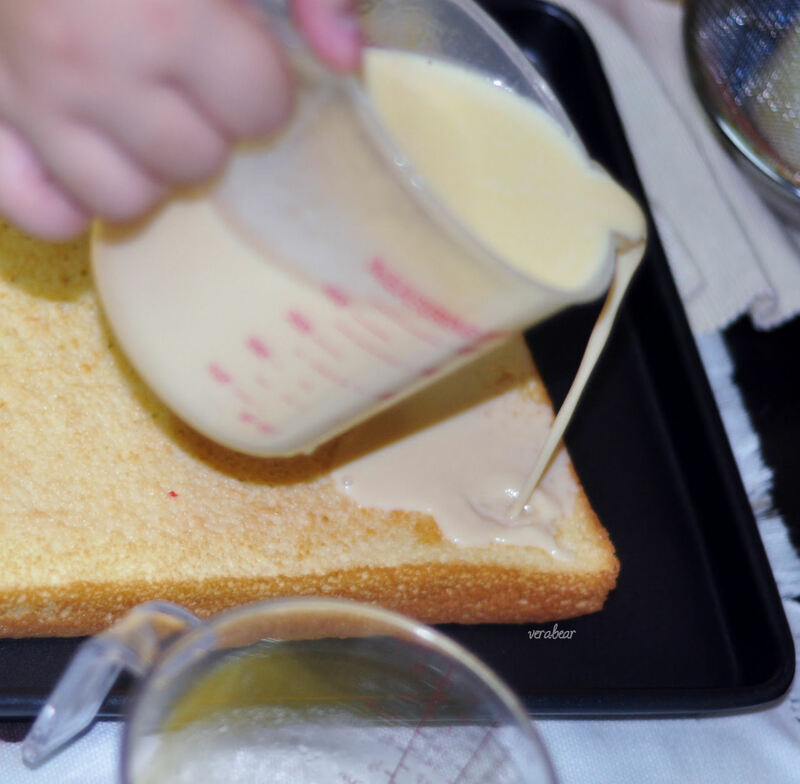 The mixed three milks are then poured all over the cake as soon as it cools. It’s a sponge cake so it’s meant to absorb liquids. Of course, because there’s a lot of liquid to hold in, some of the milk spilled over to the sides of the cake. Not to worry, because in as little as 30minutes later, all that would be gone, re-absorbed by the sponge. No photo here, but my favorite part is making the icing and putting it on the cake. 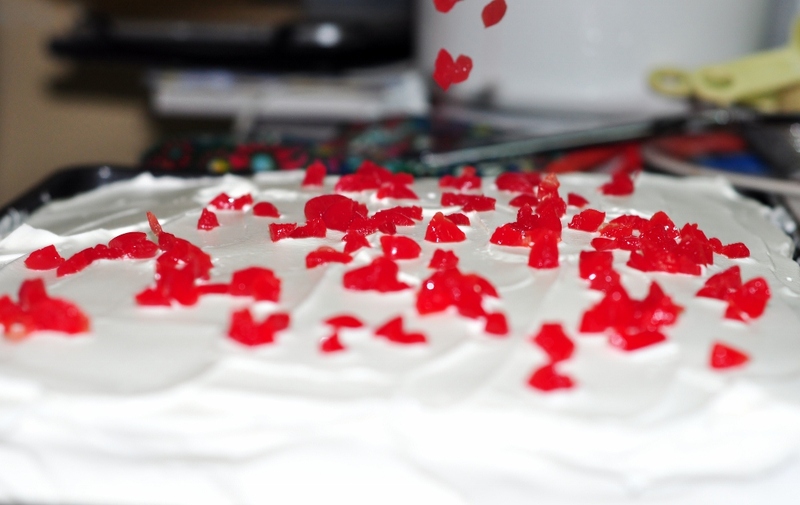 I hadn’t made icing like that before and it is so easy (both to make and to apply). While waiting for the cake to cool, and then again for the milk to be absorbed, I chopped the maraschino cherries that went on top of the cake. The red is such a nice contrast to the white frosting. We also had some canned strawberries to add variety. To view the full recipe, check out The Pioneer Woman. I also wanted to join in with Music Monday, but I can’t even preview the YouTube video I wanted to show. It’s a video of Firewoman, written and performed by local band Hungry Young Poets. The band is no longer together and the lead singer is now doing a solo act. They launched when I was in highschool, and this particular song came out on my freshman year at university. A friend who also loves music gave me the lyrics to this song, and I sang it to audition for a music (based) organization. I love singing this song. If you’d like to check it out, do so here: Firewoman. (remember, I haven’t previewed the video but a friend shared it on his Facebook wall. I hope it plays well and does the song justice) Let me know what you think, ok? But enough of my Internet woes. 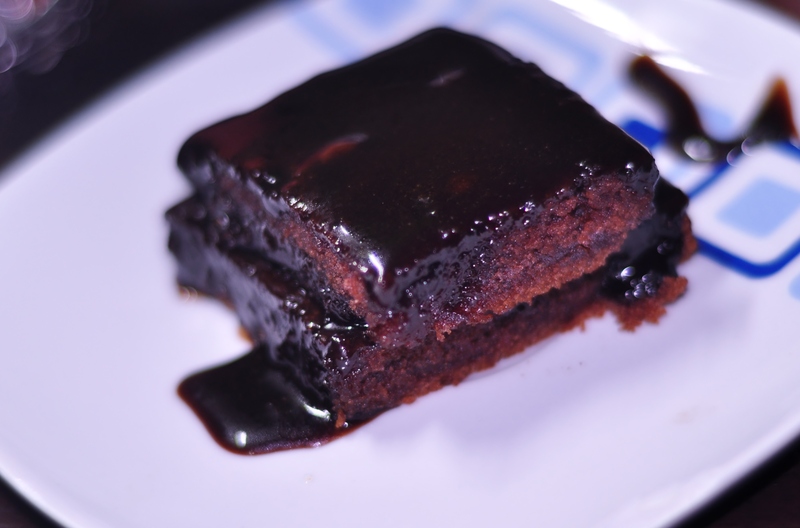 Remember the chocolate sheet cake I made on Friday? Well, the recipe calls for Buttermilk. It’s something that’s not available in the smaller groceries around here. Good thing the Pioneer Woman also shared the substitute for buttermilk! 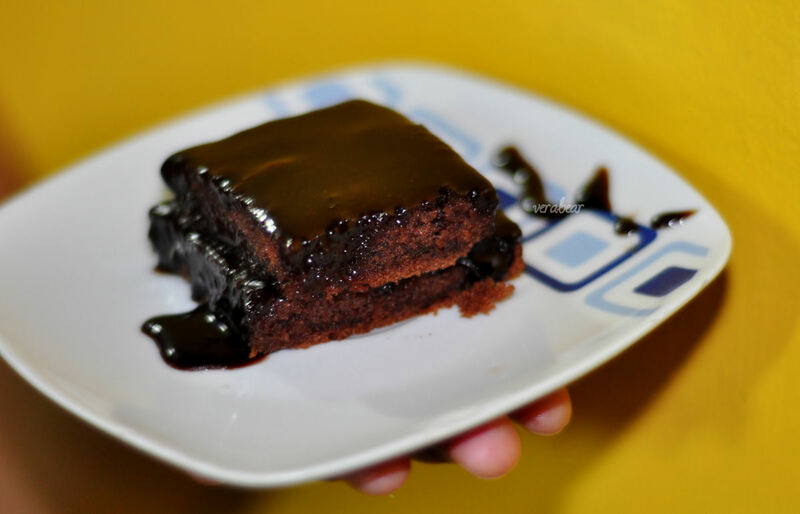 Click picture to go the Chocolate Sheet Cake Recipe! Finally, wet and dry ingredients mix! 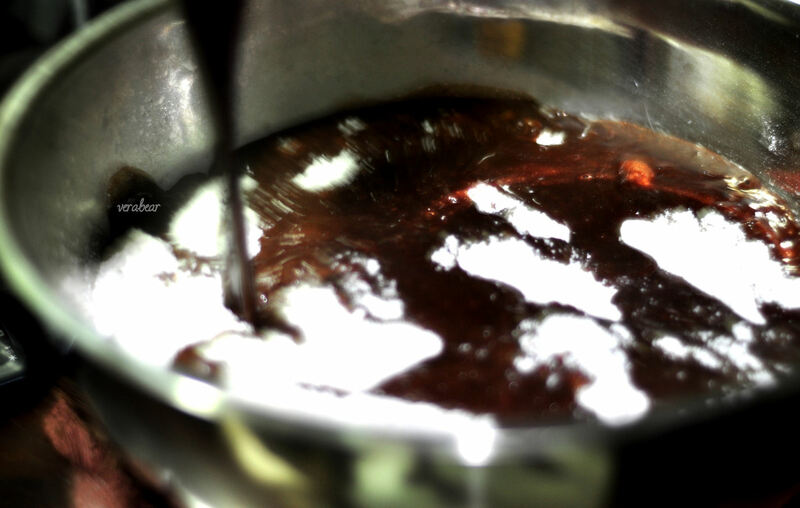 I used to dread this part when baking brownies because the mixture tends to get quite heavy. If you do it by hand, it can get pretty tiring. For this cake though, it’s very light and easy. I didn’t have to use my mixer for this one. It was so easy to bake this cake but it didn’t exactly turn out perfect. Our floor is uneven, hence, the oven’s uneven too. We ended up with a sheet cake that was thinner on one end, and thicker on the other. A friend of Alfred’s cousin who got to taste the cake at Theo’s birthday bash commented that it had a tad too much of vanilla. I personally couldn’t detect it, but I think it’s because I was using vanilla oil and we put a little too much considering there was vanilla on the cake and the icing as well. My version also doesn’t have pecans on it. Not because we’re allergic to nuts, but because we didn’t have any. I think the nuts would balance the sweetness so we’re definitely going to get some for next time. But the biggest thing is this: I didn’t feel like it was the best chocolate sheet cake ever. 🙁 I used to make chocolate cake and cupcakes with a recipe I modified and I remember that tasting more richer, chocolatier. Probably because it has some coffee in it. But I refuse to give up on this recipe, so I’ll give it another shot some other time. Don’t get me wrong though, it tasted great! I packed a few slices for Theo (Alfred’s cousin), and also a few for my cousin Candy. They share the same birthday 🙂 I also gave slices to the kids downstairs, specially Hannah whose birthday was the next day, September 18th. I had a wonderful weekend. First, because it’s a long one (but not long enough ;)), three days due to the fact that I filed Sunday as vacation leave. Second, because I baked three cakes in three days! It was sooo much fun, the cakes were light to make, and the boyfriend was my assistant. And all three turned out too good not to share. What’s with the bake-a-thon? Special people in our lives celebrated their birthdays and we chose to honor them by making cakes. Friday, 17th of September was my cousin Candy’s birthday, as it was Alfred’s mom and cousin Theo. We made Pioneer Woman’s Chocolate Sheet Cake. She calls it the best chocolate sheet cake ever so I really had my hopes up for this one. The next day, we decided to make another cake to bring to the surprise party for Alfred’s Nanay. She’s not into sweets and not a big chocolate fan so we opted for something else. 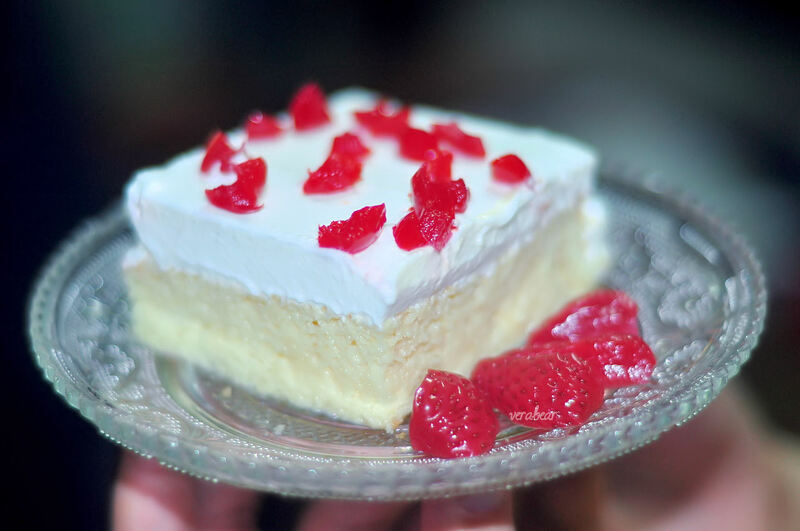 Tres Leches Cake. I also used PW’s recipe. I fell in love with Tres Leches. And all who tasted it, loved it. We loved it so much we decided to make another one today so my parents and my brother could taste it too. Also because we only had one teeny slice of the cake last night at the party, hehe. I have more pictures of the bake-a-thon, and a few more stories to share, but my weekend’s over in a few hours and I gotta go get some sleep.